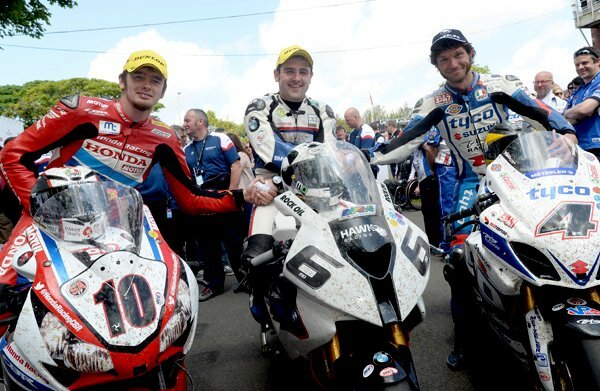 Entries closed for the 2015 Isle of Man TT Races, fuelled by by Monster Energy, at the end of February, and race organisers have confirmed a truly stellar line-up. As in previous years, every class was oversubscribed, presenting the organisers with the huge headache of selecting who made the final start list but they have produced a world class entry suitable for the greatest motorcycle race in the world. The RST Superbike and PokerStars Senior races will again create the most intrigue and headlines. With the top 20 seeded riders all having lapped comfortably over 127mph, it's the strongest top end of the field ever witnessed. It's no less impressive further down the order with the top 70 riders having already lapped at over 120mph and with 91 entrants targetting the 72 starting places that are up for grabs, this year's two six-lap races should be absolutely barnstorming affairs. Honda Racing's John McGuinness, the 21-times TT race winner now back to full fitness, will lead the field off at number 1. He will be eager to reclaim his King of the Mountain title from Michael Dunlop, whose eight wins in the last two years have seen him rightfully grab the headlines. Now on board the all-new Milwaukee Yamaha R1, Dunlop goes off at number three with James Hillier, another member of the 131mph club, sandwiched between them on the Quattro Plant Bournemouth Kawasaki. Bruce Anstey, the current outright lap record holder, will start from his customary number five position. The Kiwi is again on the Valvoline Racing by Padgetts Honda and will have that elusive first Superbike victory in his sights. After Dunlop's feats of 2014, there are three BMW-mounted riders in the top ten. The Tyco pairing of William Dunlop and Guy Martin go off at numbers six and eight respectively with Michael Rutter starting at number four. The Midland's based rider is expected to switch to the Penz13.Com team. Gary Johnson, last year's opening Monster Energy Supersport race winner, will again take the number seven plate, which this time will be the JG Speedfit Kawasaki, Mark Smith-Halvorsen's BSB team making their debut at the TT. The top ten is completed by 2010 hero Ian Hutchinson (PBM Kawasaki) and Conor Cummins, the Ramsey Rocket continuing in the Honda Racing set up where he'll be looking to get his first win after a second and a third last year. Dean Harrison, riding for the Mar-Train Racing team, is onboard the second front running Yamaha at number 11 with Keith Amor, making his big bike return, lining up at number 12 on the RigDeluge BMW. Another Superbike returnee, Ryan Farquhar sets off 20 seconds later on his KMR Kawasaki, the former team-mates starting either side of 2013 TT Privateer's Champion Lee Johnston (East Coast Construction BMW) who will again assume the number 13 plate. Dan Kneen is set to go at number 15 although the talented Manxman is still in the process of finalising his plans having seen his proposed ride with Millsport Racing fall through. David Johnson (Smiths BMW) goes at 16 followed by last year's sensational newcomer Peter Hickman (Briggs Equipment BMW), Dan Stewart (Wilcock Consulting Honda), the rasping Norton of Cameron Donald and Steve Mercer who completes the top twenty on his privateer Honda. Dan Cooper, Ivan Lintin - set for a strong season on the RC Express Racing Kawasaki - Russ Mountford, Jamie Hamilton and consistent Italian rider Stefano Bonetti are all just outside the top twenty. Horst Saiger, who almost broke the 125mph barrier last year, will surely achieve that feat this year with regular top privateers Ben Wylie, Rob Barber, Davy Morgan and Robert Wilson back for more. Some of last year's leading lights - James Cowton, Martin Jessopp, Michael Sweeney and Daniel Hegarty - give further proof of the strength in depth of the entry with Jamie Coward and Derek Sheils returning to the fold having both missed out on last year's meeting. The entry has further been bolstered by a large influx of leading Manx GP competitors who are already knocking on the door of 120mph+ laps, most notably the winners of last year's Junior, Senior and Lightweight races, Andy Lawson, Andrew Soar and James Neesom, which adds further strength and means the line-up from 20th to 70th is arguably the strongest it's ever been. Others to make the step up include overseas visitors Kamil Holan, victor in the 2012 Newcomers race, Marco Pagani and Bjorn Gunnarsson and Frank Gallagher, Sam West, Anthony Redmond, Ben Rea and Matthew Rees. The quality of entry is so high this year that just four newcomers go in the Superbike class with former World Supersport Championship contender Robbin Harms from Denmark the most notable newcomer. Current Irish Supersport champion Derek McGee, the latest rider of great potential to receive backing from Wilson Craig, former Thundersport Champion Tom McHale and Franck Petricola, the Frenchman now fully recovered from injuries sustained at last year's North West 200 meeting are all expected to perform well on their mountain course debuts.